Fribourg & Treyer of 34 Haymarket sold snuff and the best quality at that. 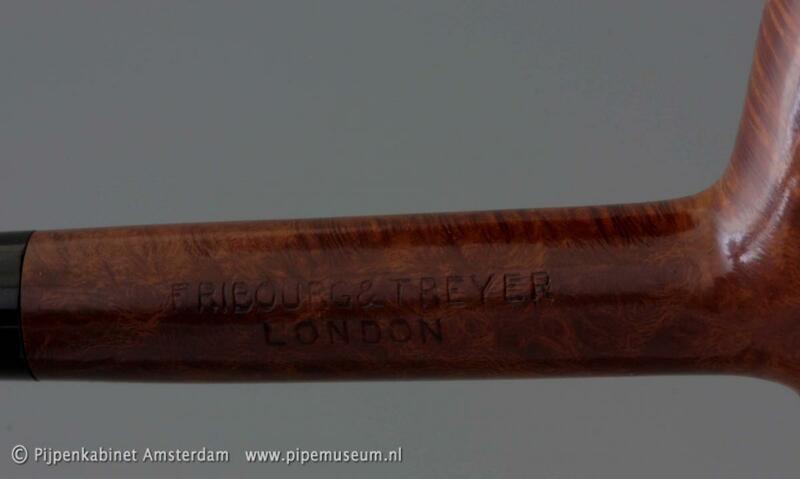 But, a partnership between a Mr. Fribourg and a Mr. Treyer had never existed. The firm was allegedly started in 1720 by P. Fribourg, although the earliest surviving ledger is dated 1764. (1) It is not clear whether the same P. Fribourg was in control of the shop all those years, or whether more generations had the same initial. According to Evans, the Fribourgs had originally come from Switzerland. From a tax assessment record of 1767 for the St. Martin in the Field parish, it is certain that a Peter Fribourg was paying taxes for a property in the Haymarket. He retired in 1780 and the shop was taken over by G.A. 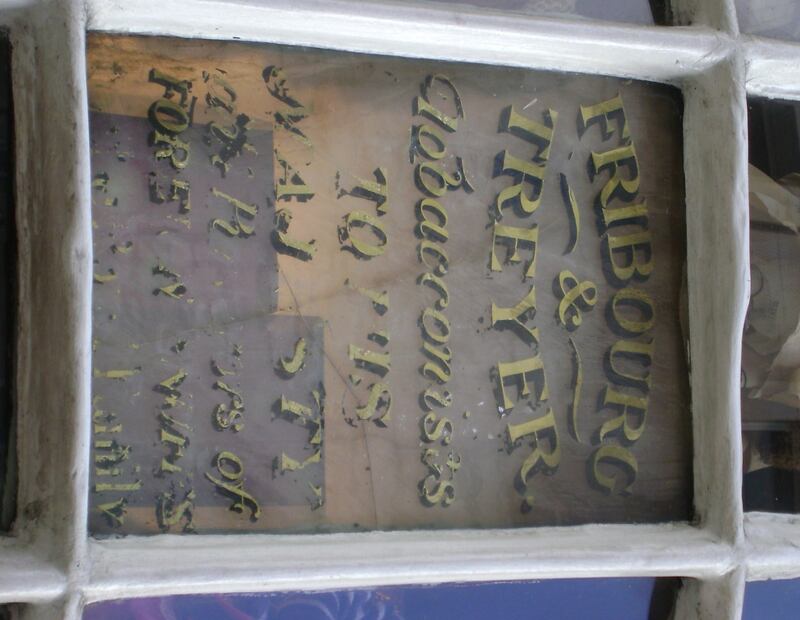 Treyer who linked the – no doubt well-known and highly esteemed – name of Fribourg to his own. Had he been pestered by former clients? He sounds fairly annoyed about the non-existing connection between him and Treyer. Gottlieb August Treyer, originally from Germany, had married Martha Evans the same year he took over the snuff shop and was granted naturalisation in 1793. (2) The couple had no children and when they retired in 1803, the daily management was put into the hands of Price Evans, Martha’s brother, during the minority of the three sons of Richard Evans, one of Martha’s other brothers. By 1815, Martha and Gottlieb were both dead(3) and the two nephews George (1786-1867) and Gottlieb August Treyer (1789-1869) were old enough to manage without their uncle. Later, they were joined by their younger brother Robert Lloyd (±1803-?). This partnership was dissolved in 1858 in favour of the next generation, Gottlieb August Treyer junior (1818-1899), the son of G.A.T. senior, George Arthur Carter (1833-1887), son of George, and Price James Evans (1815-1885), the son of James Evans, a cousin of G.A.T. senior and George. (4) After the death of these three cousins, the firm was then managed by August (1843-1906), son of G.AT. junior, and George (1867-after 1920), the son of G.A.C. Evans. August died in 1906 and the firm became the responsibility of George and August’s son W. Bridgman (1876-after 1920). Lost track of all these Georges and Gottliebs? 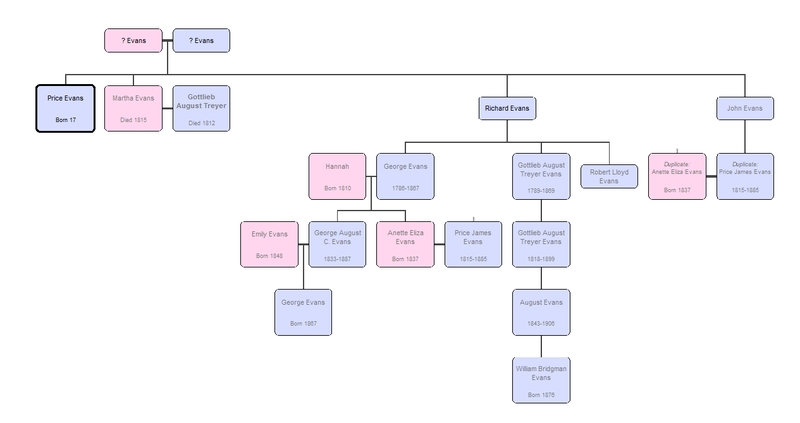 Perhaps this family tree will help. 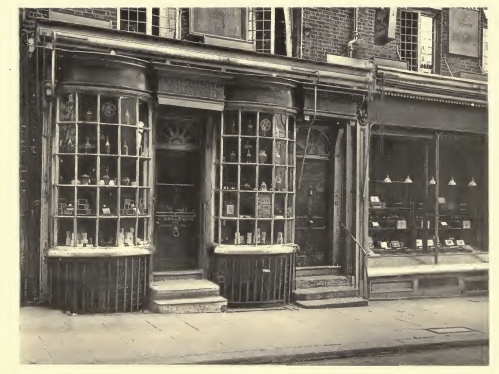 The shop itself with its distinctive bow windows, although no longer in the possession of the Treyers or Evanses, but a souvenir shop, still looks very much the way it had always been. 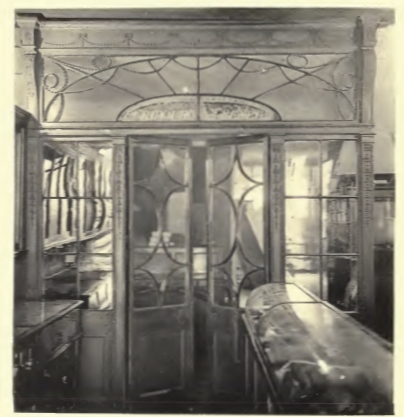 George Evans in his 1920 book already remarked that “the greatest care has been taken to ensure its preservation and the structure is entirely in its original state”. He does, however, apologise for the need in the 1890s to replace the stone steps as they had “become so worn by continued use, and not unlikely to cause an accident to someone walking over them, it was necessary to replace them, this being the only serious renovation that has been made to the front”. 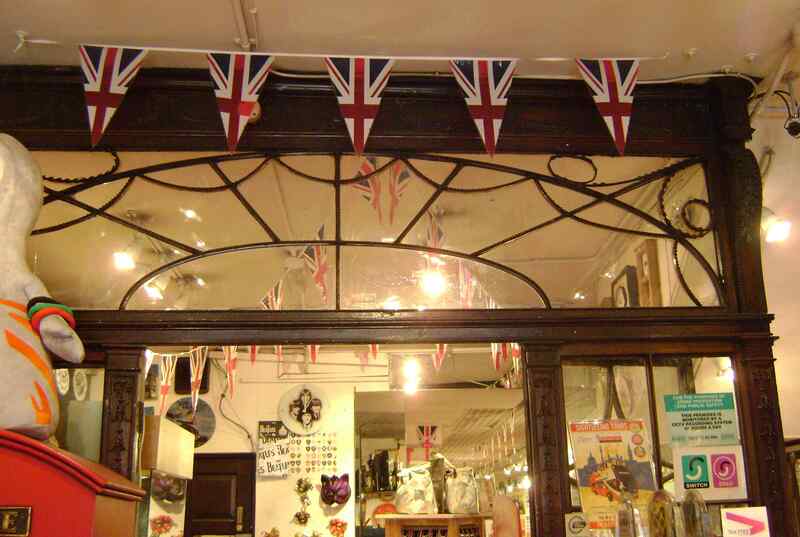 Inside, separating the original front shop from what Evans calls the “first inner room” is an Adam’s screen which can still be seen, although the glass panelled doors seem to have disappeared. The private entrance on the right of the shop was once the only way to get to the outbuildings at the back and the horse that the first G.A. Treyer kept, had to go through the house to the stable. The upper floors were sometimes let, but often used by one or another member of the family. In 1912, number 33 was acquired to accommodate the expanding business, but was quickly dismissed by Evans as not of the same historical value, it “has been much more altered for modern requirements, and contains now nothing of interest”. Evans states that they opened what he called ‘The City Branch’ at 18 Cornhill in 1834, but it was probably slightly later as their name does not appear in Tallis’s Street View of 1839 when number 18 is still occupied by J. Viney, a tailor. They do appear in the 1847 Supplement, but by then they have moved to number 51. The City branch was to move again in 1869 when 51 and adjoining premises were bought by a bank and Treyer moved to 2 Leadenhall. In 1881, they moved once again when their block was pulled down to widen the street. 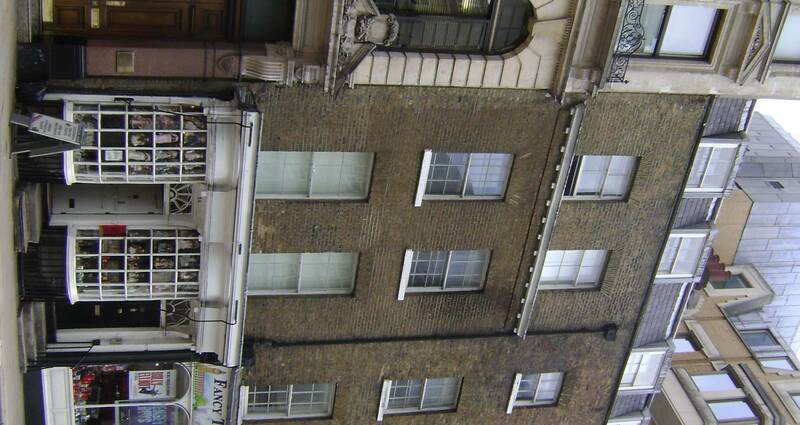 They temporarily relocated to 70 Cornhill, but came back to Leadenhall Street (to number 3) in 1882. They were still there when Evans wrote his book. In the 20th century, the firm also opened branches in Oxford and Cambridge, but already in 1814, they used agents to sell their wares further afield than London. In an advertisement in Trewman’s Exeter Flying Post or Plymouth and Cornish Advertiser of 9 June, 1814, they announce that they have appointed Thomas Balle, 203 High Street to be their sole agent for Exeter and its vicinity. An N.B. at the bottom of the advert states that Balle supplies “teas and groceries of every description”. What to make of the last sentence in the advert above “To prevent mistakes, they find themselves under the necessity of giving this public notice, that they have no concern whatever with any other shop in London”. Their City Branch had not been opened yet, so that cannot be the reason for the confusion, nor would the wording be quite the same if it had been one of their own branches. 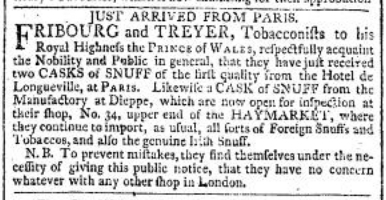 They are possibly referring to Fribourg & Pontet, snuff-makers at 134 Pall Mall who are listed in the 1808 Post Office Annual Directory and were still there (at number 124) when Tallis produced his Street Views. Evans mentions a J. Fribourg who traded in the colonnade of the Opera House, Haymarket, in the later 18th century. He sold snuff, but also opera tickets. Also in Tallis’s Street View we find ‘Fribourg Evans’ at 6 Regent Street, but whether the latter was perhaps an offspring of the Haymarket Evanses is not clear yet. Tobacco was rasped by hand to produce snuff as the shop sign of “the rasp and crown” already indicates. Tobacco could be rasped to a varying degree of fineness, hence the expressions Fine, Denigros and Gros. Fribourg & Treyer sold a large number of snuffs, such as Dutch Carotte, Lundy Foot, Dunkirk, Brazil, Montagne and Marino de Leipsic. They even made up snuff mixtures according to special recipes for individual customers and kept the recipes in a special book for later reference. George Evans was proud of the distinguished customers the firm had over the years and says that “several of the Popes were supplied by Fribourg and Treyer, but indirectly, and, according to an old book, Napoleon, at St. Helena, was also supplied by the Firm in the same way”. Evans quotes from an old account ledger for the account of Beau Brummell “1 lb. Bureau and Canister, sent to the Prince of Wales 7s. 6d.” (3 Oct. 1799), but “it was very shortly after this that His Royal Highness dealt directly with the Firm”. Note the capital F in Firm. George IV was not the only Royal to get his supplies from 34 Haymarket; in 1809 Princess Charlotte started an account with F&T and in 1819 the King of France. In all, Evans lists five pages of customers whom he apparently considered worthy of mention, the majority of them styled Lord, Earl, Sir or Lady. The average guy in the street gets no mention. Although snuff was the main commodity at F&T’s, they also sold cigars, small numbers to begin with, but from 1850 onwards in increasing quantities. You could buy your cigars in large quantities and have F&T look after them, just collecting a small number when you needed them. In this way, the correct conditions for keeping them could be guaranteed and your cigars would always be fresh. Some customers, especially at the City Branch, even kept their own open box of cigars on a special shelf in the shop and came in every day to smoke a cigar on the premises. Loose tobacco for use in pipes was also sold, but Evans does not have much to say about them “for the varieties were so few in use until fairly recent years”. Cigarettes were first mentioned in the accounts in 1852, but became more frequent from 1866 when the first Russian cigarettes were sold. In 1880 the Egyptian cigarette was introduced and with cigars, they slowly but surely took over from snuff and became the mainstay of the business. 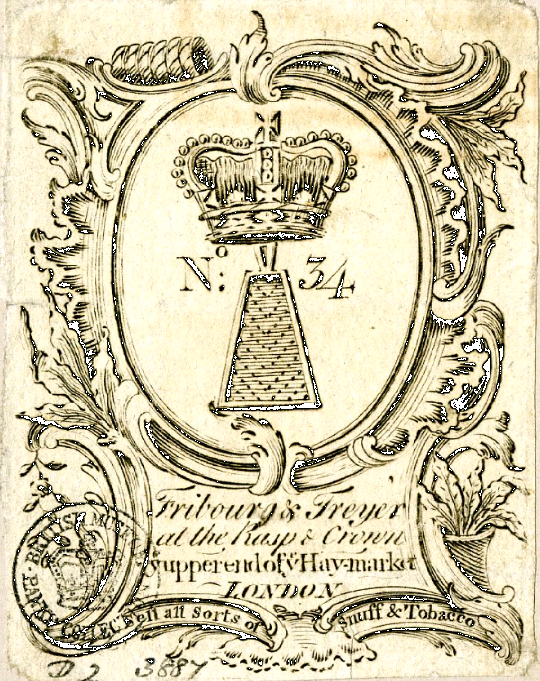 (1) George Evans, The Old Snuff House of Fribourg & Treyer at the Sign of the Rasp & Crown no. 34, St. James’s Haymarket, London, S.W.1720-1920, . The ledger was apparently still available to Evans when he wrote the history of the firm. The present whereabouts are not known. (2) Journal of the House of Lords, volume 39: 1790-1793, 18 Feb., 5 June, 11 June and 21 June 1793. (3) They lived the last years of their lives in Brighton. Gottlieb’s will was proved 17 December 1812 (PROB 11/1539/365) and Martha’s 20 March 1815 (PROB 11/1566/298). (4) London Gazette, 1 June 1858. You may also like to read the post on Fribourg & Pontet, tobacconists, or at Georgian Gentleman’s blog post on snuff here. Who is making Fribourg and Treyer pipe tobacco now? Could you provide me with an email o telephone contact. I am working for a tobacco importer in Spain and I am thinking about expanding our catalogue. Thanks. Kolhase & Kopp, a German company, is making the Fribourg & Treyer pipe tobacco. Wilson’s of Sharrow, of England, is making the snuff.